Over the years, Volkswagen has sold million of its Golf and Jetta economy cars. Their reputations and popularity solidified their image as fun, but not overwhelmingly powerful, street cars. Cars like the 1980s era VW Rabbit and Cabrio models were peppy little rides with small engines. Even the GTi — VW’s original “hot hatch,” a high-performance hatchback — was not exceedingly powerful. It just had a modest, 107-horsepower 1.8-liter 4-cylinder engine under the hood. But that as so ’80s. 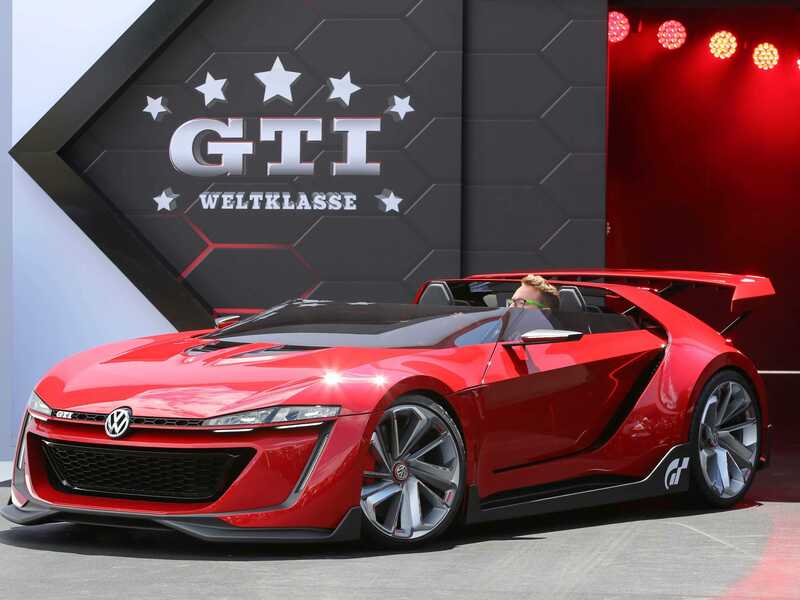 Volkswagen’s latest GTi has nearly double the horsepower of the original version: a 210 horsepower, 2.0-liter turbocharged 4-cylinder. Sure, the GTi has gained a few pounds over the years. But the jump in horsepower means even with a bulky new physique, the new GTi is faster than its slimmer predecessor. 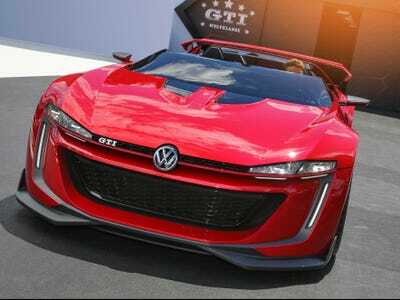 As impressive as the new GTi may be, VW’s Roadster Concept — set to make its US debut next week at the Los Angeles Auto Show — is truly nuts. Even better, the Roadster has the muscle under the hood to back up the car’s aggressively brawny looks. The 3.o-liter twin-turbocharged V6 packs quite a punch — producing a sort of ridiculous 503 horsepower. The result is a concept car capable of theoretically gunning it to 60mph from a standstill in just 3.5 seconds with a top speed of 192 mph. VolkswagenThis belongs in Gran Tourismo. 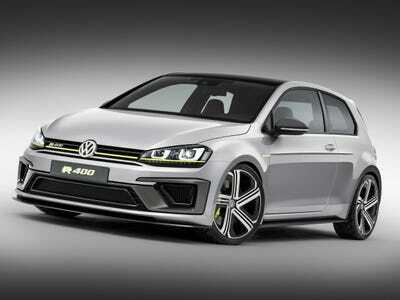 In addition to the Roadster, Volkswagen is also bringing the Golf R 400 to the L.A. Auto Show. So what makes this hatchback so special? As indicated in the name, the “400” in Golf R 400 is a reference to the 400-horsepower engine lurking beneath the hood. All of those ponies are generated by a 2.0 turbocharged inline 4-cylinder engine the 400 shares with the regular Golf R (the Golf R cranks out 292 horsepower). All of this translates to a 0-60 time of 3.9 seconds and a top speed of 173 mph: Porsche territory. So far, VW is calling the 400 a concept, but with its production-based powertrain and subtly modified sheetmetal, we are inclined to believe the car is closer to a showroom than the company’s museum. As awesome, as this year’s duo of Golf-based concepts may be, the craziest in recent history is certainly 2007’s Golf GTI W12-650. As you may have guessed, tucked behind the drivers seat is a mid-mounted twin-turbocharged 6.0 liter W12 engine from the Bentley Continental. The W12’s 650 horsepower made this concept terribly fast, but also rather difficult to drive — as experienced by “Top Gear” host Jeremy Clarkson, who said the car was incapable of going around a corner. 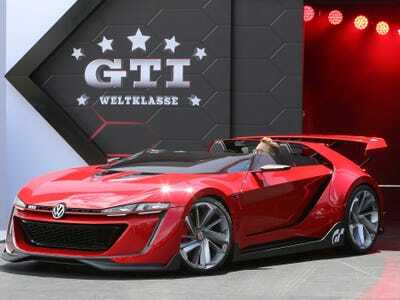 Amazingly, the GTI W12 was built in just 8 weeks in the runup to the 2007 GTI Festival. Very Cool. To top it all off, the mad genius responsible for successfully cramming a Bentley’s engine into the back of a small hatchback is none other than Audi’s new chief designer Marc Lichte. Fortunately for Lichte, building ridiculously fast and good looking cars won’t be a side project at his new job, it will be part of his everyday duties. We’re excited to see Lichte’s next crazy design.